The Mississippi River is a fascinating water course, weaving its way through the history of our nation and the fabric of our lives. You could spend a lifetime learning about the river and its many facets in drips and drabs, or you could spend a day touring one of state’s better museums—the Tunica RiverPark in northwest Mississippi. Situated right on the banks of the river just west of Tunica, this 24,000 square-foot award-winning, one-of-a-kind, interactive and interpretive museum explores Ol’ Muddy from the Ice Age to the present age, from one end to the other, and from top to bottom. Few aspects of this mighty waterway are left out: the exhibits include an animated map of the river, several large riverine aquariums, a wetlands diorama, and a sampling of artifacts from prehistoric Native Americans, Spanish Conquistadors, and Colonial settlers. Exhibits also highlight the steamboat era, take you underwater in James Eads’ diving bell, put you behind the controls of a Coast Guard rescue boat simulation, and fly you over the farmlands of the Delta—over the river at and below tree top level—skimming the waves towards the museum. The museum leads you along a logical course towards understanding the Mississippi River’s strong impact on our civilization—through the ravages of wars and floods, the development of commerce, the growth of recreation—and how the people who have chosen to make their homes along its banks have responded. This is only a small sampling of what the museum offers—a museum that extends far beyond its physical walls. From the second floor, you can ascend to the observation platform high above the river and watch the everchanging vista of the largest river system in North America. Step outside and take a quiet walk along the 1.9 mile EcoTrail that winds through the park’s wetlands forest. There is even a covered veranda stretching along the Mississippi River side of the building, lined with large, comfortable rocking chairs—perfect for viewing. From the museum’s observation deck high above the river (see the photo of the building at the top of this page), tows, sunsets, and sandbars make fine viewing. 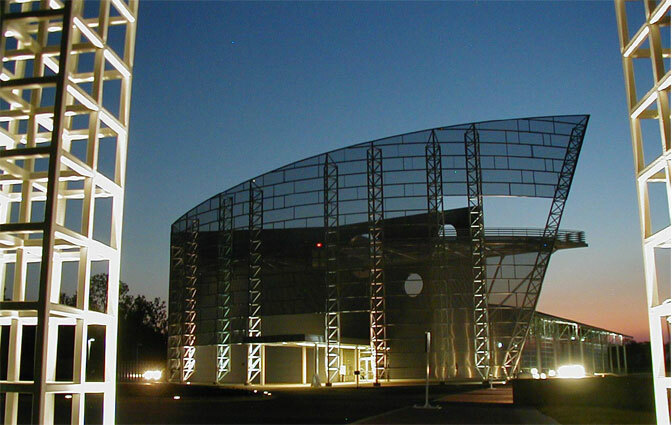 There are also spacious meeting rooms for events, lectures, and workshops plus a gift shop. And for a closer view of the river, consider a sight-seeing cruise aboard the Tunica Queen, a three-deck, 300 seat “paddle-wheeler” that docks at the museum. Several cruises are offered daily during the season that runs from March until October (on Saturdays only in November and by special arrangements in December)—be sure to check the schedule before heading that way with a cruise in mind! For the Tunica Queen’s cruise schedules and rates, visit their web site at www.tunicaqueen.com or call 866/805-3535. A highly detailed model tells the story of the Arkansas Post (above left), the first semi-permanent French settlement in the lower Mississippi River Valley. The Tunica Queen leaves her dock at the RiverPark (above right) and heads down the Mississippi on a sunset cruise near the end of the season in late October. 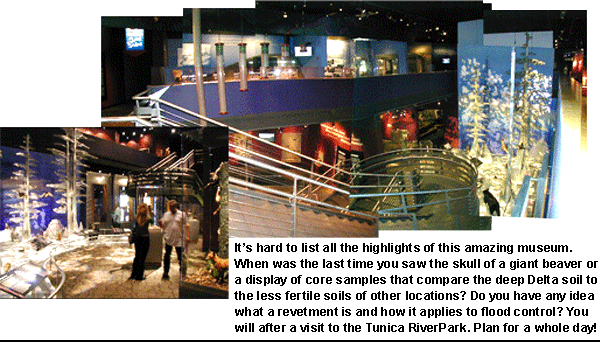 All ages are guaranteed to find something of interest at the Tunica RiverPark Museum. Jerlene Rhodes, the executive director, says, “The RiverPark continues to surprise and delight visitors with its stunning appearance and unique location right on the Mississippi River.” Open from 9 a.m. until 5 p.m. seven days a week (closed Christmas Day), the RiverPark can be reached taking Highway 61 to Tunica, then heading west on Casino Strip Resort Boulevard for 1.8 miles. Take a right onto Fitzgerald’s Boulevard, and then a left onto RiverPark Drive through their gate. Be prepared to pay a small admission fee. 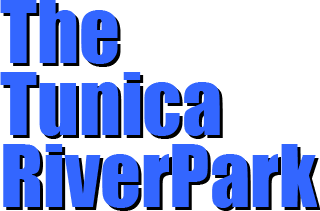 For more information about the Tunica RiverPark Museum, visit their web site at www.tunicariverpark.com or call 866/517-4837.